When setting up the Cactus LV5 for our FirstUse review, we looked at tripods we thought might be suitable to pair with its laser trigger. 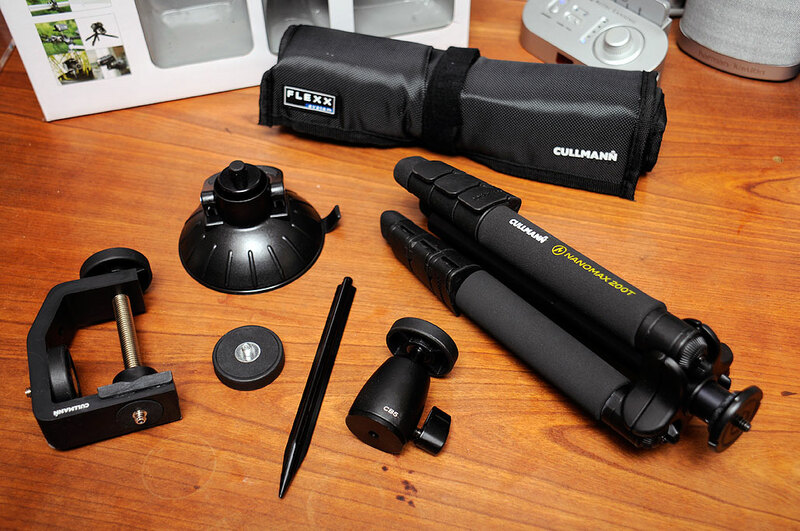 We have a lot of tripod options in our studio, and chose the Cullmann Flexx system—which we showcased in our 2013 Holiday Gift Guide—for the assignment. The Cullman Flexx Touring set is the most portable of the five different configurations available, and what we’ll be using with the Cactus LV5. There are a lot of pieces to this set. We will look at them individually and in combination to show some of the possibilities of the Flexx system. It is clear what the Cullmann folks were thinking when they assembled this set. They know that securely mounting a camera in the wild means grabbing onto any available stable surface, be it a tree, a gate, or even a rock. Whatever the situation, there is something in the set that will hold the camera steady. Folded up, the NANOMAX is about 11″ long. 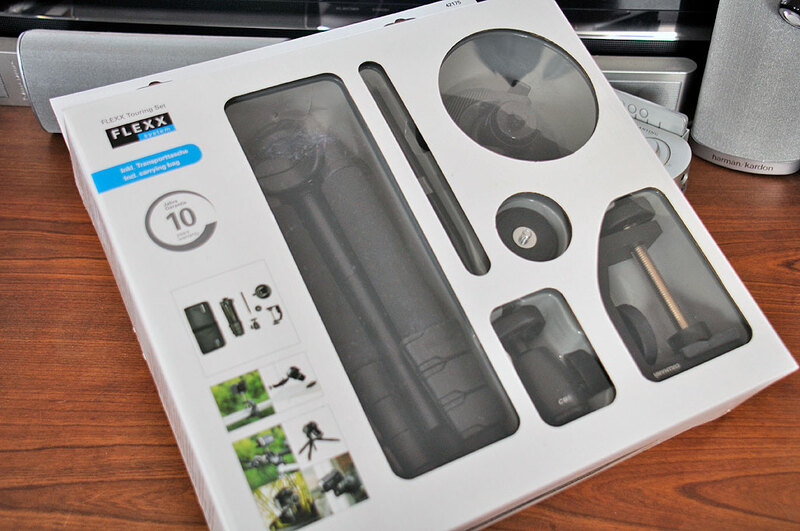 Its clever design means that it can sit as low as 8″ under a mounted camera (good for closeups) but can reach 32″ high when fully extended (good for snapping pics over fences). It’s maximum carrying capacity is a little over 4 lbs, more than sufficient for all point-n-shoots and many DSLRs. It will certainly be sufficient for the Cactus laser trigger components. The legs of the NANOMAX are not round tubes, but are shaped so that they do not turn in place. This gives them more rigidity and stability under load. There is padding on the upper section for easier and more comfortable handling, especially when cold outside. Of course, not every surface will be amenable to the use of a tripod. For those times we can reach into the Flexx bag of tricks and put together something suitable. Note that all of the screws and sockets in the various pieces are the standard 1/4-20 size (1/4″ diameter, 20 threads per inch) suitable for mounting a camera. They may also be attached to each other in combination. Need to get a ground-level shot or from a lower vantage point? Use the ball-head and the spike or the suction cup. Need to go a little higher? 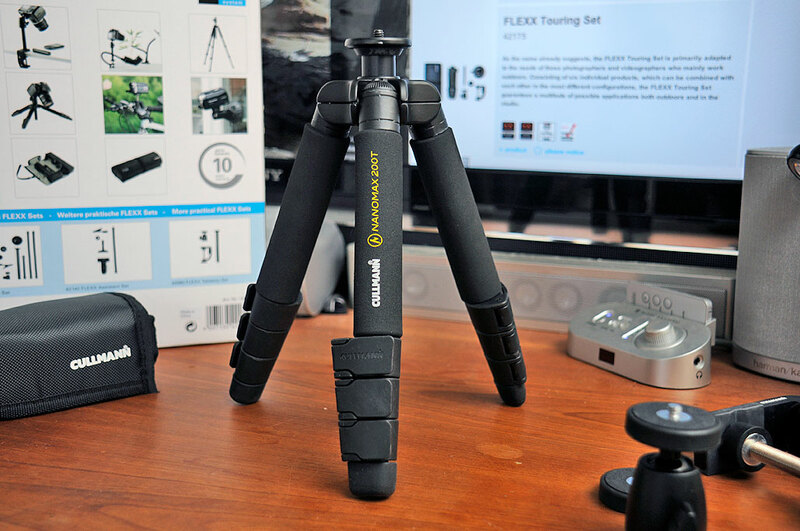 Remove the central post from the tripod and add it to one of the other mounts. The combinations are endless (almost)! As this set was designed to hit the road it came with a carrying bag to transport everything. The roll is made of nylon, has pockets for all of the pieces, rolls up quickly into one well-secured package, and plenty tough to handle the wear and tear of travel. The pieces are coming together for the FirstUse of the Cactus LV5 Laser Trigger. In the next article, we will show how we set up the Cactus LV5 laser trigger in combination with this Cullmann Flexx mounting set for the stop-action shoot. Look for it later in the month.